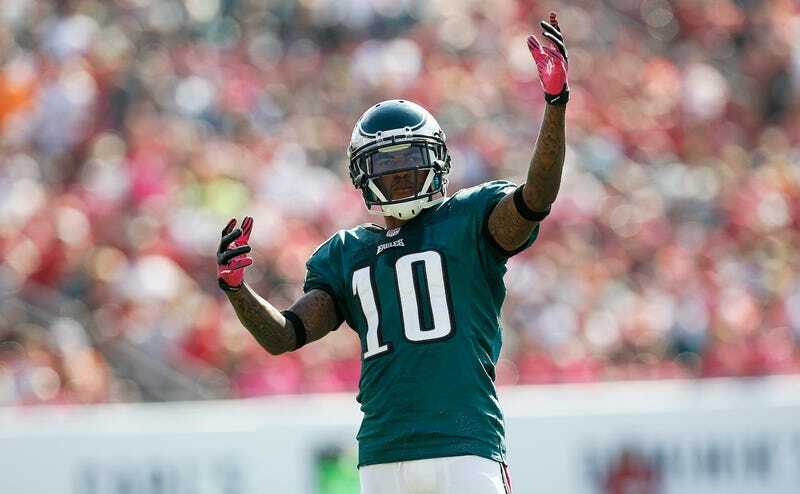 How Did Washington Get DeSean Jackson So Cheap? The Philadelphia faithful will have their chance next season to tell DeSean Jackson exactly what they think of him, when he returns as the newest member of a divisional rival. Jackson agreed to terms with Washington yesterday, on a relatively team-friendly deal for one of the league's top receivers. Multiple sources put the deal at three years, $24 million, which is absolutely not a lot for a star receiver coming off the best statistical season of his career. But in the NFL, contracts don't mean a ton—two years ago, the Eagles signed Jackson to a five-year, $50M deal, and we all know how that turned out. The real key figure is the $16 million in guaranteed money Jackson will receive. That's a hefty up-front payout, but depending on the distribution of the contract, it means he won't make much of a salary cap dent in the last two years of the deal. (And with so much guaranteed, it's more likely his tenure will last the entire three years.) The length of the contract is a good deal for Jackson too; he'll hit the free agent market again at age 30, still in his prime. Despite whispers of other teams being interested in Jackson, he appeared to only ever seriously negotiate with Washington, and didn't visit with any other team. In an interesting aside from Albert Breer, the NFL.com reporter claims many teams didn't bother with Jackson because they believed he was seeking $10 million a year, or what he was set to earn with the Eagles this season. If true, that's a failure on his agent's part, but that $16 million in cash will make sure he doesn't dwell on it. You can probably consider that sizable guarantee a premium paid by Washington to ink Jackson before he had time to shop himself elsewhere. Jackson knows what it's like to see a long-term contract torn up, and knows how important it is to get big money up front. Washington's offense now looks scary on paper. This franchise hasn't had a big-play receiver quite like this in some time (Santana Moss's peak years probably come the closest). Jackson's mere presence should benefit Pierre Garcon and Alfred Morris, and the addition of Andre Roberts and a healthy Jordan Reed give Robert Griffin III more options than he's ever had. There are questions on the O-line and all across the defense, but this team should be significantly better. Which is odd, because Ashley Fox's remarkably stupid column from yesterday dwelled on "addition by subtraction," the notion that the Eagles will be a better team for losing their best receiver. Funny how that never works the other way—no one would dare argue that Washington will be a worse team because they now have DeSean Jackson. And I get the distinct feeling that no NFL executive, no pundit, and no fan will be willing to claim Washington screwed up in signing an elite wideout to an affordable deal just because he's taken photos with gang members.